Forgiveness is often misunderstood. People withhold it for many reasons. Are any of these familiar to you? Some withhold forgiveness because they believe forgiving validates what someone else did. Some withhold forgiveness because they believe holding on to the injury punishes the other person. Some withhold forgiveness because they believe their injury gives them strength. In truth, there are countless reasons people withhold forgiveness. 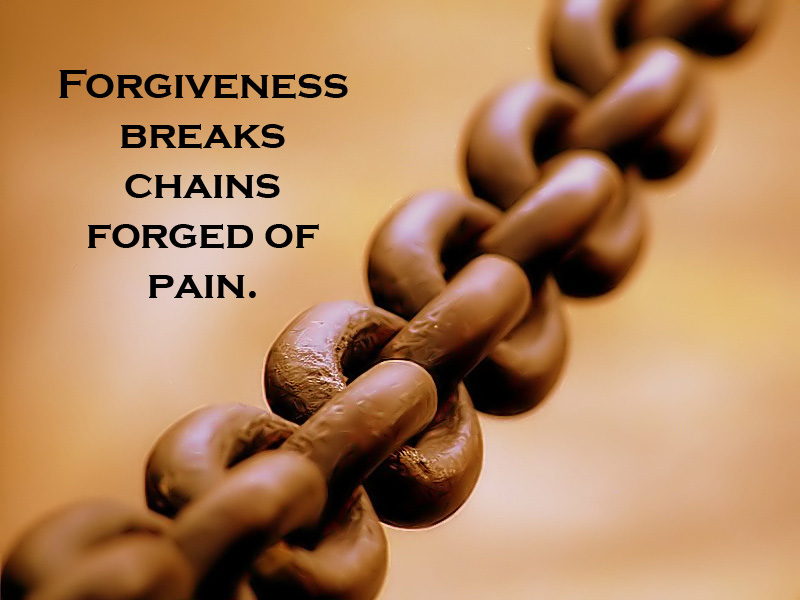 Forgiveness shatters the chains of hate. Forgiveness heals wounds of the heart and soul. Forgiveness restores hope, love, joy, and purpose. Forgiveness allows you to get on with your life! So if you’re holding on to something that slowly festers in your soul, as yourself, Why? What purpose does it serve? Does it help you when you clutch tightly to your pain, your anger, your anguish? Does it help those you love? If there’s something you’re holding onto, forgiveness you’re withholding for a real or imagined wrong, isn’t it time you let it go? Isn’t it time to FORGIVE! Only you can release yourself from the chains forged by anger, hate, and pain because, like it or not, you forged the chains. It might seem hard to let these things go, but in the end your life will be so much better when you’re free from the anchors of your past. Make a new start today. Greetings from Idaho! I’m bored to tears at work so I decided to browse your website on my iphone during lunch break. I love the knowledge you provide here and can’t wait to take a look when I get home. I’m amazed at how fast your blog loaded on my cell phone .. I’m not even using WIFI, just 3G .. Anyways, good blog! Hmm it appears like your blog ate my first comment (it was extremely long) so I guess I’ll just sum it up what I had written and say, I’m thoroughly enjoying your blog. I too am an aspiring blog blogger but I’m still new to the whole thing. Do you have any helpful hints for first-time blog writers? I’d really appreciate it. The main thing is to start, just start writing from your heart. There are many free blog platforms you can use. If you have your own domain name, you can install wordpress and then use one of their free themes to begin. It also helps to promote your posts on social media, like Twitter, Google +, and Facebook. After you write a blog post put an enticing snippet of it on the Social Media platform of your choice and link back to the post.